If you're a car care enthusiast, you already know that towel-drying is a must if you want to prevent water spots. Well, CR Spotless Water Systems is changing that rule. Water spots occur because all water is full of minerals, like calcium, magnesium, sodium, and various other dissolved mineral salts. You might have heard of total dissolved solids in reference to tap water. All water has them, and they're a real problem for detailers. When water evaporates, it leaves these minerals behind on the vehicle in little rings that we call water spots. Eventually, minerals etch auto paint. The etching requires compounding. 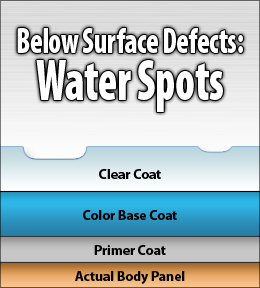 It's best to prevent water spots altogether with the CR Spotless Water Systems. Before CR Spotless Water Systems, you had to towel-dry your vehicle to prevent water spots. We carry many microfiber drying towels that are excellent quality and very safe on paint, but wouldn't it be great if you could skip that step? Just wash, rinse, and go. You can do exactly that with CR Spotless Water Systems. Dissolved mineral solids are either positively charged cations or negatively charged anions. The exchange resin in the CR Spotless Systems replaces cations with hydrogen. This exchange produces acids that are neutralized by anion exchange resin. The result of this process is hydroxide. Hydrogen plus hydroxide equals pure, clean water. Without minerals, water just disappears, leaving nothing on the vehicle. You save time because there's no need to towel-dry! You eliminate the risk of towel-induced paint marring, like swirls and fine scratches. By preventing water spots, you're also preventing etching. 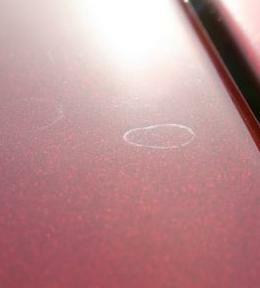 Below-surface paint damage requires time-consuming compounding and, in some cases, paint repair. CR Spotless Water Systems save your paint! You've seen how water spots cloud up a windshield with rough, scaly minerals. CR Spotless Water Systems prevent water spots all over your vehicle. Use CR Spotless Water Systems to wash household windows, too. It's nearly impossible to dry exterior, second story windows and now you don't have to. CR Spotless Water Systems are excellent for individuals and for detailing businesses. Unlike some water purifying systems, the CR Spotless Water Systems generate plenty of clean water to give your vehicle a thorough wash. Choose from 100 gallon medium output units for personal use or opt for the high output 300 gallon units for professional detailing. Wall-mounted and portable systems are available. CR Spotless Water Systems are easy to use. Hook the system up to your water hose. 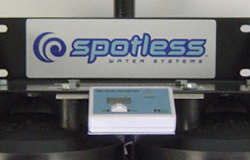 As water flows through the system, it is automatically "cleaned" of dissolved solids. The water that exits your nozzle is clean, de-ionized water that will not cause water spots! CR Spotless Water Systems work with replaceable resin cartridges. The TDS meter on the system gives you an accurate reading of the total dissolved solids in the water. When it reads 30 ppm or more, the cartridges need to be changed. An included water restrictor maintains the optimal flow rate of water to ensure that it is thoroughly cleaned as it passes through the resins. CR Spotless Systems have built-in TDS meters to indicate when the resin needs to be replaced. CR Spotless Water Systems are not just for mobile detailers. Anyone who has ever tried to remove water spots from any surface will find a use for a CR Spotless Water System. Clean household windows, outdoor furniture, cars, boats, RVs, motorcycles, and ATVs. Easy access to clean, de-ionized water will change how you clean! Save time and enjoy a clean, spot-free vehicle. These products are shipped directly from the manufacturer's warehouse and are not available for international or expedited shipping.